October 13 and 27 are the trolley tour dates for Salem, Ohio. The tours are scheduled for 6pm, 8pm and 10pm. The tour includes Hope Cemetery, Grandview Cemetery, and Cry Baby Bridge. The cost is $15 per person. 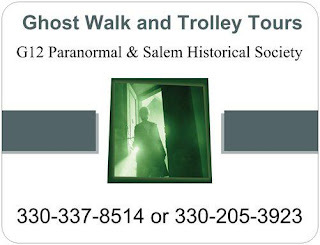 You can catch the trolley at the Salem Historical Society! Karen Biery, author of "Believe", will be on hand at Hope Cemetery to tell you the Haunting Tale of Goldie Bell Taylor.